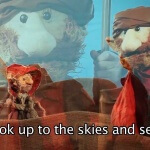 Passover Fun » About Passover » What is the difference between Sephardi and Ashkanazi Passover Practices? What is the difference between Sephardi and Ashkanazi Passover Practices? The biggest difference between Sephardi and Ashkenazi practices during Passover has to do with what is called “kitniyot.” Kitniyot includes any grains or pseudo-grains, including corn, rice, beans, lentils, peas, string beans, chickpeas, soybeans, peanuts, and all legumes. Kitniyot also includes anything made from these items, such as peanut butter, corn syrup, or soybean oil. Sephardi people are allowed to eat kitniyot while Ashkenazi people are not. The reason why this originally came to be is unclear, although there are many theories. One is that in ancient Europe it used to be common for all different types of grains to be stored in the same place in giant barrels. It was not uncommon for some wheat flour from one barrel to become mixed into the rice in another barrel. However, in Sephardi regions this was not the practice. It may also have been more common in Europe for kitniyot items to be ground into flour, which could then be confused with or mixed up with flour made from a grain that was definitely not allowed on Passover. Indeed, we can even see this today, as gluten-free alternatives like rice flour become more and more popular. On the other hand, the prohibition against eating kitniyot may simply have originated with a very strict rabbi in a very small community in Europe, whose practices were taken up and slowly spread. 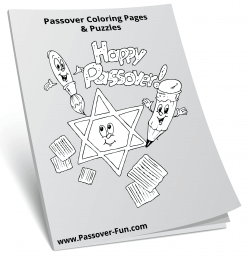 Sephardi Jews do have some other Passover customs that are different from those of their Ashkenazi cousins. One of these is that Sephardi Jews do not recite a blessing over the second or fourth cups of wine, while Ashkenazi Jews do. The Sephardi haggadah, the book that is a guide to the seder, is also slightly different from the Ashkenazi haggadah, with more variety toward its end. Some Sephardi Jews also end the holiday of Passover with another celebration, a kind of party called a mimouna. 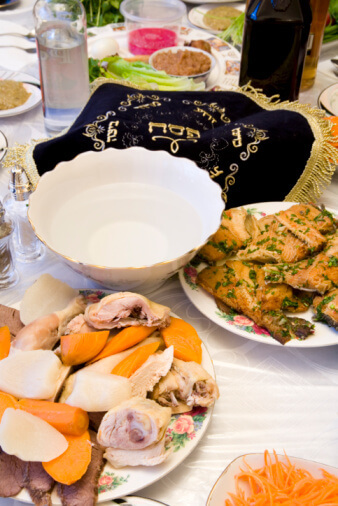 The mimouna is in honor of Rabbi Maimon, the father of the great Jewish sage Maimonides, and people visit one another’s homes with gifts of freshly-prepared chametz foods, like pancakes, donuts, and crepes. Although most Jews no longer live in the same places their great-great-grandparents did, they still celebrate and follow the same traditions. This is because in Judaism, traditions long practiced have the force of law. 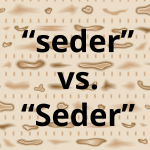 Today, you will find the differences described above still being practiced in modern Sephardi and Ashkenazi homes all over the world.